Here are a few problems for your enjoyment! Our facebook page has more problems: here. Two cups stand in front of you: one with coffee and one with milk. Take a teaspoon of milk and pour it into the cup with coffee. Then move a teaspoon of the mixture back to the cup of milk. Is there now more coffee in the cup with milk, or milk in the cup with coffee? What is the last digit of 72008? What is the 2008th digit after the decimal point in the decimal expansion of 1/7? What is the maximum number of points of intersection of 7 distinct circles? Look at the letter "M" inscribed in the circle on the right. 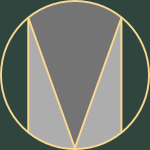 Which is bigger, the darker shaded area above the "M", or the lighter shaded area below? If the diameter of the circle is 100mm and the slanted lines of letter "M" are 90mm long, what is the difference between the areas above and below the "M"? A curious student asks his math teacher: "I heard you have three daughters. How old are they?" The math teacher says: "Well, the product of my daughters' ages is 72, and the sum of their ages is the number of the room we are in." The student writes a few things down and then says: "I don't have enough information." The math teacher exclaims: "Ah, of course! I forgot to tell you that my oldest daughter has green eyes." The student says: "Oh, now it's clear. Their ages are..."